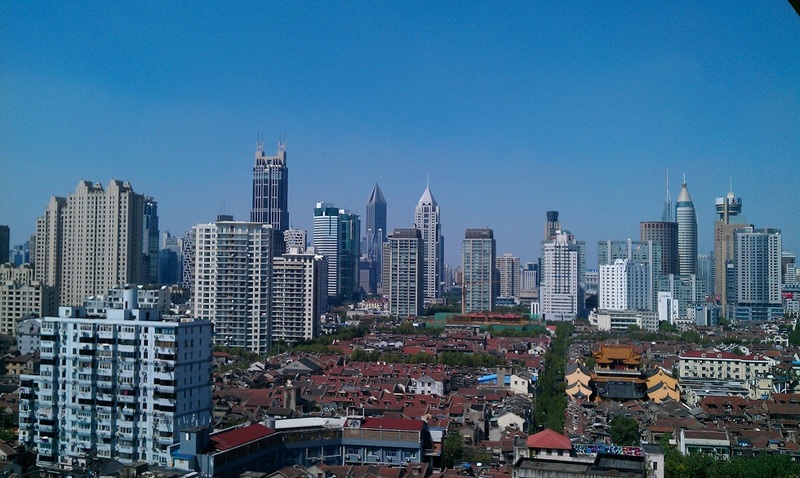 Shanghai is a wild and wonderful city in which to live. 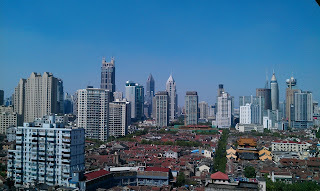 There is so much to say about China in general and Shanghai specifically. 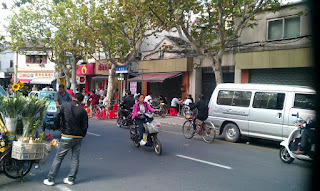 So, I thought it might be easiest to start with a few daily observations--the "givens" of any day in Shanghai, which might help formulate an impression--something I couldn't even conjure up before I arrived. The traffic: I could not have really pictured the city at all before arriving. I was thinking New York on a massive scale and pictured bumper-to-bumper cars packed within skyscrapers and people bustling about on the streets. 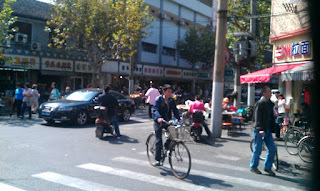 But, car traffic is limited in Shanghai, so it is not the sheer number of cars that make up the "traffic" of the city. It is the mad mix of bikes, pedestrians, bikes and carts with all sorts of loads on the back, electric bikes, scooters...all going in different directions with seemingly few traffic rules. 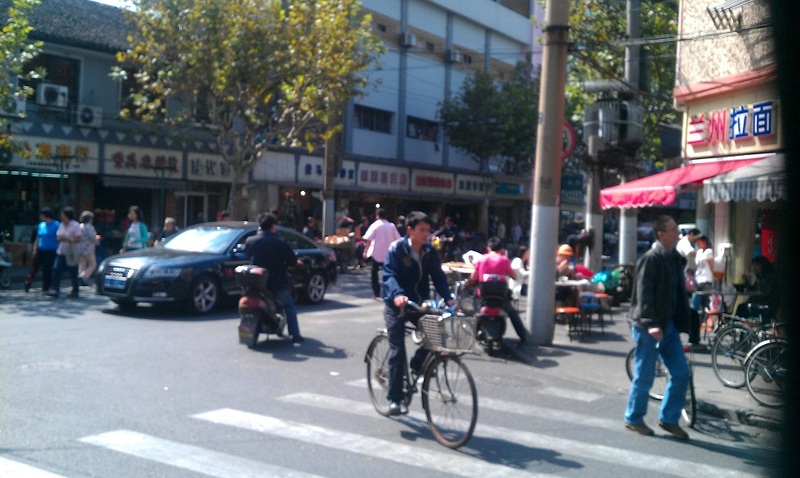 Hard to see but he was the tiniest, slowest pedestrian who crossed right in front of a large bus and then went diagonally across on of the largest intersections, casually strolling with his market purchases. And, while the car traffic seems much less than in many other big cities in the world, you couldn't tell it from the noise. The horn is a must for every occasion, or no occasion at all. The zebra stripes? Meaning (if any): pedestrians, watch out! I love watching how people have adapted and prepared for all of the variables getting around via open air vehicles. 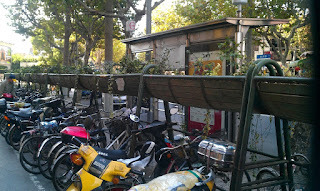 Many motorcyclists have special padded hand/arm protectors and all sorts of baskets and carts have been fitted to bikes. Delivery persons ride bike carts carrying everything from large loads of laundry (read: the sheets and towels of an entire neighborhood) to building supplies. Women and men hold toddlers on their laps on scooters (I saw a Dad yesterday with a toddler in front of him holding on to his baby brother-wow!). When it rains, bikers break out their rain suits or large ponchos designed to fit entirely over them and the handlebars. The variety: I only have to step outside my apartment complex to immediately be surrounded by the commerce of a massive city managing the lives of some 20 million people. In the streets surrounding home, we have a massive grocery/all purpose store that even provides its own private buses to bring people from around the city. 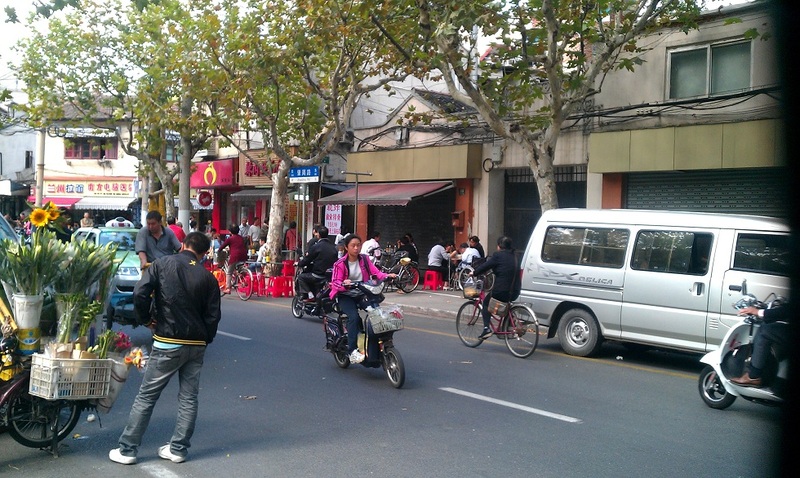 The side streets are filled with delicious (and not so-have you ever smelled stinky tofu?) smells of street food and noodle shops. There are convenience stores everywhere, along with minuscule shops specializing in everything from mops to extension cords to towels. Most of these also function as social gathering spots for meal times and Mahjong games and I love strolling past at dinner time to see the families sitting on small tables outside having their rice or noodles. Our neighborhood is part of the ancient city that once was all of Shanghai--small alleys full of tiny shops and old homes. Private living is very public--so the lanes are filled with laundry in every space, people using the common sinks, meals enjoyed on sidewalks and all manner of daily life. While the style of living is changing, it remains ever-present in our neighborhood and many others. Our neighbor recently had a visitor who commented on her surprise at seeing the old homes and low-rise communities in the midst of the skyscrapers. Here you find modern and sleek aside tiny and ancient. We can take one metro stop or short walk and visit shops I cannot afford. Gorgeous high end stores line the large shopping street around the corner from the tiny maze of lane houses. The city is a study in contrast. It is certainly thought-provoking as a newbie (a much more daily, in-your-face reminder of this gap, which exists everywhere but is often segregated, nicely air brushed over or simply not so extreme in close proximity). 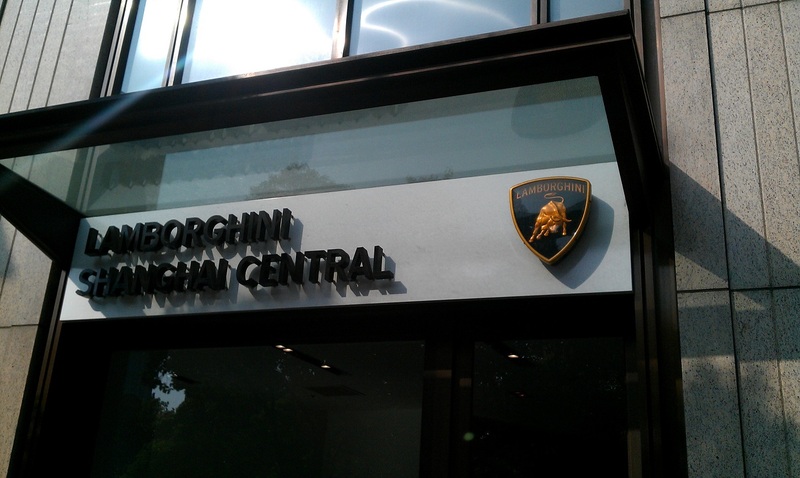 Just up the street from our home: the Lamborghini store, next to Rolls Royce. The "international-ness" which means you can get products from anywhere, albeit for a price, and can meet people from all corners of the world. There is a long (shady) history of foreigners in Shanghai and it remains a magnet for expats--so you can always get your fix of native English speakers or junk food from back home. I did expect this somewhat, but after living in Europe, it amazes me that I can find so many more things so much more easily here. We didn't miss much in Spain from home, but I'll never forget my surprise when I saw Jif peanut butter at the local market here (we had to go to the "American store" and pay through the nose if we got a peanut butter craving in Spain). 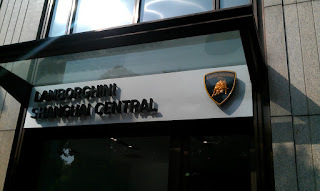 And, there is much better Spanish, French and Italian cuisine thus far here than we can find in the U.S. Of course, we are in Shanghai and my point of reference is living in much smaller cities in the U.S. The Chinese food. Ok-this might be stupid to list but then again I did have someone ask me "Is the Chinese food better there?" I feel like I've been cheated my whole life by what has been passing for Chinese food at home. Again, I say this not having lived in New York or San Francisco, where I know legitimate options exist (and I know there is plenty of bad food here too). But, this has been a wonderful surprise for someone who never listed this high on my favorite cuisines. I am now a proud dumpling addict and seek out noodles as my new favorite comfort food. I'm just getting started trying all the different regional cuisines and dishes. Expect many more posts and pictures on this topic! I've gotten a lot of questions about life and customs here and will be glad to answer what I can (especially as I learn more). I have also read some wonderful books about both Shanghai and China, in a small attempt to gain some knowledge and understanding, and I'm glad to recommend some to anyone who is interested. I heard a lot about China on the news before coming, but never really had a clue...and still don't, but I'm enjoying learning.